India is a very big country. India is the seventh largest country in the world. From Kashmir in the north to Kanniyakumari in the south, it extends for about 3200 km. From Gujarat in the west to Arunachal Pradesh in the east, it extends for about 3000 km. India is the second most populated country in the world, after China. New Delhi is the capital of India. The Central Government in New Delhi takes acre of the welfare and security of the people of India. India is divided into 29 States and 7 Union Territories. The main offices of the State Governments are located in their respective capital cities. A great variety of landforms is found in India. There are mountains, plains, rocky lands and sandy deserts. India also has many rivers, lakes and islands. To the north of India, we have a wall of very high mountain ranges called the “Himalayas”, which means ‘the abode of snow’. They are the highest mountain ranges in the world. The highest peak in the world, Mount Everest (8848 meters) is located here. The mountain wall of the Himalayas stretches in the form of an arc from Kashmir in the west and narrows down to Arunachal Pradesh in the east. Many rivers, like the Ganga, the Yamuna and the Brahmaputra have their sources in the Himalayas. These rivers flow throughout the year, as they are fed by the melting snow of the Himalayas. They are the Aravalli and Vindhya ranges in Central India. We have the Satpura range, the Western and Eastern Ghats. To the south of the Himalayas are the plains of India. The Ganga, the Brahmaputra and the Yamuna rivers flow through these plains. These plains are flat lands with fertile soil. These plains are thickly populated. Here the summers are hot and the winters cold. A desert is an area covered with sand and rocks stones which receive very little rainfall. The north-western part of India is a rocky and sandy desert called the Thar Desert or the Great Indian Desert. A plateau is a high land with a flat surface. 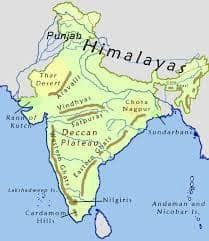 The central and southern part of India is a plateau called the Deccan Plateau. It lies between Ghats to the west and the Eastern Ghats to the east. India has two groups of islands. The groups of islands in the Bay of Bengal are the Andaman and Nicobar Islands. The Lakshadweep Islands are in the Arabian Sea. The clothes of our people differ from state to state. India being a very big country, there is a wide variety of clothes that our people wear. The saree is the most common wear among India women. The style of wearing it differs from state to state. Other popular clothes for women are the salwar-kameez and the ghagra-choli with a dupatta or odhani. Women also wear pants/jeans with shirts or tops. Girls wear frocks or pinafore dresses. Men in India usually wear trousers or jeans with shirts/T-shirts. Dhoti-kurta, kurta-pyjama or kurta-lungi is also worn in different states. Many festivals are celebrated in India. There are three kinds of festivals. Some are national, some are religious and some festivals are linked with the seasons and the harvesting of crops. Festivals are celebrated in different ways in different parts of India. Festivals of India include Holi, Diwali, Christmas, Eid-ul-Fitr, Ganesh Chaturthi, Janmashtami and Raksha Bandhan, National festival includes Independence Day, Republic Day, and Gandhi Jayanti. In India harvest festivals are too celebrated such as Pongal, Onam, Baisakhi. As we know that India is divided into 29 states, there are several different languages such as Hindi, Bengali, Marathi, Telugu, Tamil, etc.